The volcano in Bali, Mount Agung erupted. Ash rain due to volcanic eruptions in Bali, Mount Agung, felt by residents in some areas. Ash rain can be seen from the very dusty car glass. The thickness of ash attached to the vehicle is varied, from thick to thin, depending on where the car passes around the volcano. One of the locations affected by the volcanic ash caused by the volcano eruption in Bali, Gunung Agung, is Puregay Village, Pempatan Village, Besakih Kangin Village, and Besakih Kawan, Besakih Village, Belatung Village, Menanga Village. In the village of Besakih rain ash from the eruption of the mountain has been felt by residents since the early eruption of yesterday afternoon. Ash attached to daca and objects around the house is quite thick. Residents should use masks and goggles to protect themselves from the ash rain in Bali. As a result of the ash, residents went directly to the evacuation site. In Dusun Puregay, the intensity of ash is felt to be thin, but residents remain displaced. Mount Agung Bali erupted again on Saturday afternoon, November 25, 2017, at 5:20 pm. A few hours later, the volcano with an altitude of 3.142 mdpl was erupting again, precisely at 07.00 pm. The eruption of Mount Agung accompanied by a cloud of gray-black smoke as high as 1.5 kilometers. Volcanic ash is the most visible. In addition to ash, sometimes also seen a red lava flare on the top of the mountain. 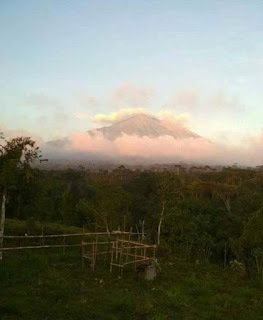 Mount reach in Bali, Gunung Agung is the highest in Bali and is the most active in Bali, located in Karangasem regency. The last eruption occurred in 1963. Until now erupt and threaten the economy of the citizens of Bali.